Even though she experienced love at the Mission, she didn’t think she deserved it. So she returned to what she knew – feeling trapped in a dangerous relationship and worrying for her son’s well-being. Sadly, she often turned to drinking. With three other children here in Indiana, living with their father, Marquisha wanted nothing more than to be a mother who was present for her kids. “From the moment I got here, I had no desire to drink,” Marquisha says. That was the first step of many toward a new life. With Christ-centered classes teaching life skills, budgeting and parenting, Marquisha appreciates the chance to rebuild her future as a mother. “The Mission even has daycare here so my baby can be taken care of while I go out and find work and housing for us,” she says. 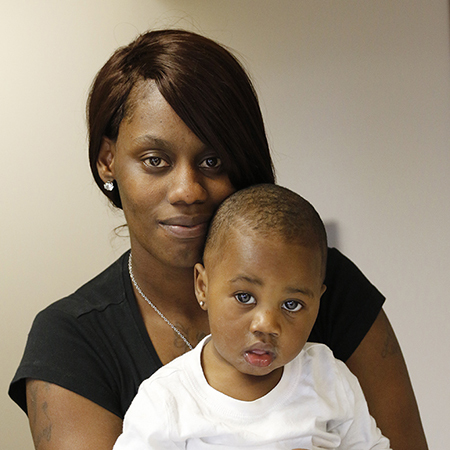 Now working two jobs and saving for a home of her own, Marquisha hopes to reconnect with her other children and be the present mother she couldn’t be earlier in their lives. WITH YOUR HELP, Marquisha and others like her are finding that God’s hope and healing are for everyone, regardless of their past or circumstances. Thank you for your generous support! Marquisha’s story of hope and healing is inspiring. Our long-term recovery programs exist to help other men and women in central Indiana find healing. Will you help provide this help to others?